Recently, RealMe has slashed the price of its selfie-centric device RealMe U1 32GB variant permanently. We are comparing the device with the RealMe 2 Pro and the Xiaomi Redmi Note 6 Pro to see which device will win the battle on paper? Both RealMe and Xiaomi are popular for launching solid devices at an affordable price. Oppo’s sub-brand company “RealMe” is now one of the fastest growing smartphone company in India right now. Especially, after the launch of RealMe 2 Pro and RealMe U1, the company has grabbed a lot of attention specifically in the last six months or so. The biggest competitor for any new company, which is aiming to build a market in India is currently “Xiaomi”. Last year, the Xiaomi has launched Redmi Note 6 Pro under its “Note” series, which is quite popular among the audience. All these three devices that we are comparing are under Rs 15,000. 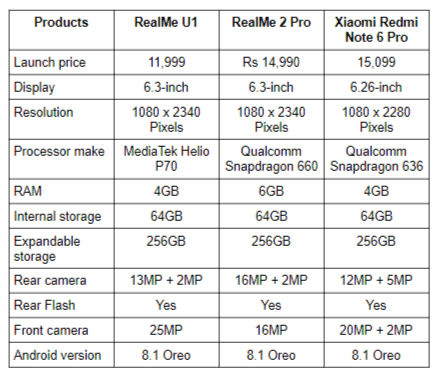 It would be interesting to see whether the RealMe devices have the power to beat the Xiaomi Redmi Note 6 Pro in terms of specifications and price. Let’s start by comparing the display of these three devices in detail. Both Realme U1 and RealMe 2 Pro sports a 6.3-inch FHD+ display that offers a resolution of 2340 x 1080 pixels. 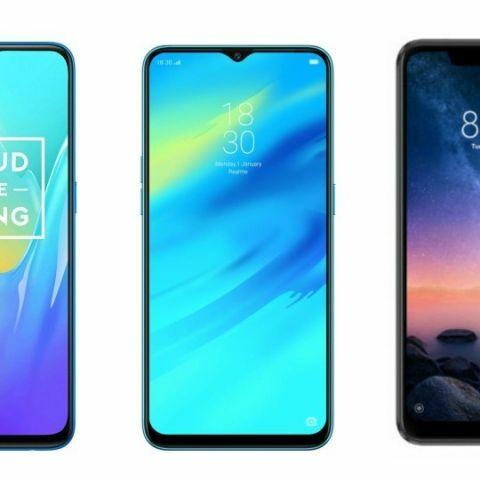 Both RealMe devices look the same in terms of design and display as they have a tiny drew-drop notch on top of it, which provides you with more viewing area. However, the Xiaomi Redmi Note 6 Pro comes with a slightly smaller 6.26-inch FHD+ display that offers a resolution of 2340 x 1080 pixels. When it comes to the performance, the RealMe U1 is the world’s first device that is powered by a MediaTek Helio P70 chipset, which is paired with 3GB RAM and 32GB internal memory. The RealMe U1 is also available in 4GB/64GB variant. The RealMe 2 Pro is powered by a Qualcomm Snapdragon 660 processor, which is coupled with 6GB RAM and 64GB internal memory, while the Xiaomi Redmi Note 6 Pro is backed by the Qualcomm Snapdragon 636 processor. The phone packs 4GB RAM and 64GB internal memory that is expandable to up to 256GB via a microSD card. As far as the cameras are concerned, the Xiaomi Redmi Note 6 Pro is the company’s first device that has dual camera setup at both front and back. The phone has a dual 12MP + 5MP rear cameras along with a dual 20MP + 2MP camera setup on the back. On the other hand, the RealMe U1 has a dual 13MP + 2MP rear cameras and a 25MP unit on the front for clicking selfies. Last but not least, the Realme 2 Pro has a dual 16MP + 5MP camera set up at the back with a 16MP sensor on the front. The RealMe U1 3GB/32GB variant is now available in India at a price of Rs 10,990, while the RealMe 2 Pro 6GB RAM variant is available on Flipkart currently for 14,999. You can get the Xiaomi Redmi Note 6 Pro online at Rs 14,338 via Amazon now.